With the Holidays close approaching, I've decided there is one thing I want. I don't need anything, so I thought long and hard about what I would like. It's hard for me to imagine spending money on myself, it's just not who I am. I would much rather buy for others, especially the kids. But Santa called, and decided I should pick out something for me. With the economy as it is, we are trying really hard not to use credit cards, so layaway seems like a good alternative. K-mart is offering an 8 week la y-away program just in time for the Holidays. You pick out your item. You can then take it to their Layaway counter and make a down payment (I hope you're listening Santa). You then just go back every 2 weeks and make a payment. After 8 weeks (and 5 visits, including the first) you get to take your new wine cooler (or whatever you're hoping Santa will bring you) home. 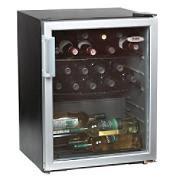 This wine cooler is going to look very nice in my kitchen, next to my wrought iron wine rack. I now just need to find a nice wine and cheese stand. Preferably one with a marble top and plenty of storage for my wine glasses underneath. Just in case Santa thinks I deserve more than the cooler.